SEAN CAVANAGH is one of the greatest Gaelic footballers of all time. A threetime All-Ireland winner and five-time All Star, Cavanagh was crowned Footballer of the Year in 2008 and captained Ireland in the International Rules series. He holds the record for the highest number of appearances (89) for an outfield intercounty footballer and was a permanent fixture in the Tyrone team after his debut in 2002. Early in 2018 he ended his glorious career with an unexpected All-Ireland Intermediate Championship title with his club, Moy. But those successes are only part of Sean Cavanagh's story. Cavanagh's youth played out amid the Troubles in Northern Ireland. He moved homes and clubs when he was ten, leaving Coalisland for Moy on the Armagh border and tells of the challenges he faced at that time - including being constantly spat on during one Ulster Championship game, having his teeth knocked out in another and his ongoing obsession to beat the arthritis that threatened his career. Along with the successes and victories throughout an incredible career, the massive strain that losing big games placed on him is laid bare. Like the dark night in 2016 when he spent hours alone just walking in his Tyrone strip for mile after mile, after losing to Mayo nearly tipped him over the edge. The time in 2009 when it was widely reported that Cavanagh's `roof caved in' before the All Ireland semi-final against Cork - now addressed here by Sean. And, for the first time, Sean reveals the full story of his controversial relationship with manager Mickey Harte, their bond over a 16-year period and the truth behind the rumours of serious rifts. Cavanagh also tells of scurrilous gossip surrounding his private life and how news journalists hounded his family during this time. He gives his view on Tyrone's RTE boycott and addresses the vicious tirade against him by TV pundit Joe Brolly that made headlines. On his road to greatness, Cavanagh also turned down a professional AFL career. 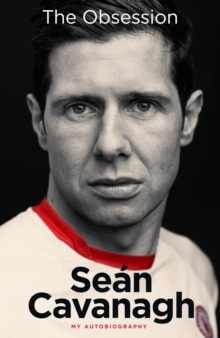 This exhilarating book now reveals the enormous lengths he went to to ensure a lasting legacy at home in Ireland and the lifetime obsessions that have made Sean Cavanagh a legend of the game and the man he is today.